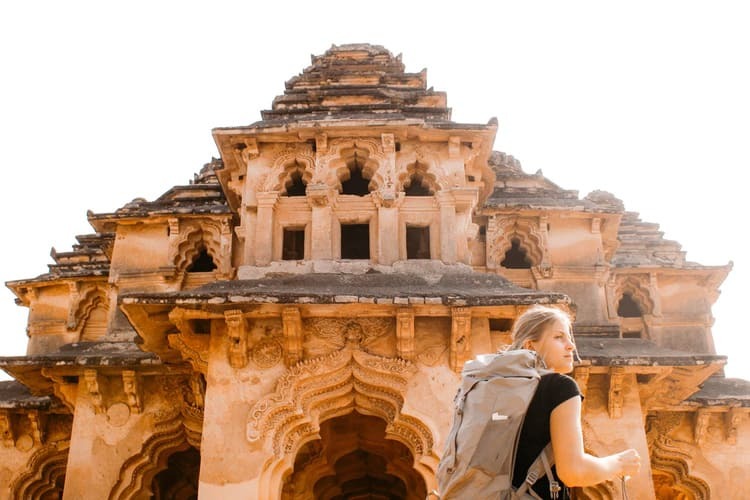 Home » India » Why every architecture lover should visit Hampi once! Have you ever been to a place where it felt like you’ve come back in time by centuries, to the land of the kings, of war elephant stables, of large temple complexes? Hampi might offer you one such experience. 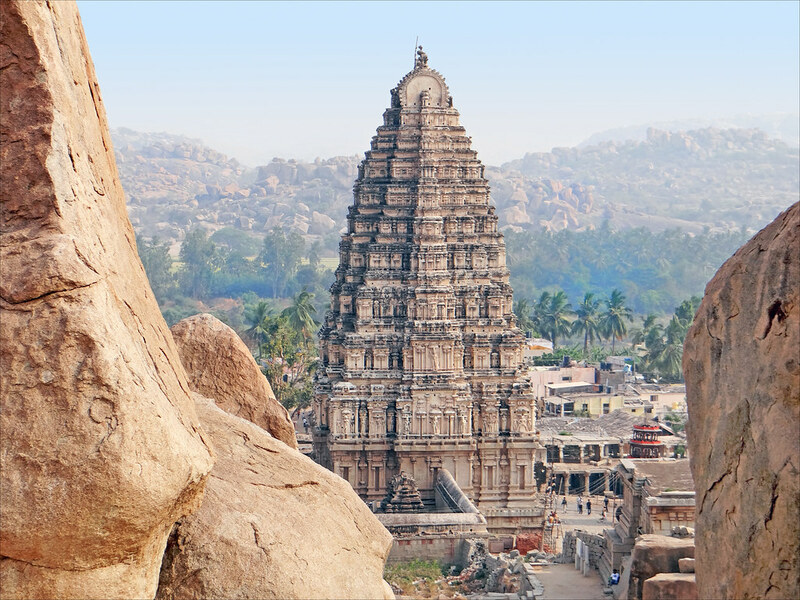 Located in Karnataka near the city of Hosapet, Hampi is not only one of the thirty-seven UNESCO Heritage sites in India, but also an architectural marvel of the 15th Century Vijayanagar empire. It is a collection of more than 1,600 surviving remains including forts, temples, royal complex, mandapas, and shrines. The place is in picturesque surroundings amidst striking and beautiful scenery depicting nature at its best. Recently, Hampi figured second on NYT’s list of 52 Places to Go in 2019. The mighty Tungabhadra river runs through the region creating meanders nourishing the emerald-green paddies and darker-green banana plantations. Hampi is well connected both by road and rail. The closest airport is at Bellary which is nearly 65 km from Hampi. Hospet, which is about roughly 15-20 km from Hampi, is the nearest railway station and bus station that offers connectivity to nearly all major cities of south India. Hampi is a major weekend destination for the people working in Bengaluru. Hampi Express is a daily train running between Bengaluru and Hospet. Also, there are a set of State transport (KSRTC) buses playing from Hospet to the places like Goa, Bangalore, Bijapur etc. From Hospet, one can take a local bus or a shared auto or taxi to reach Hampi. Within Hampi, one can rent a bicycle or a scooter at cheap prices. You have to submit a photo identification proof to rent them. The other option is to take an autorickshaw or a taxi on hire for the different sites. The Virupaksha temple is the oldest shrine, the principal destination for pilgrims and tourists, and an active Hindu worship site. 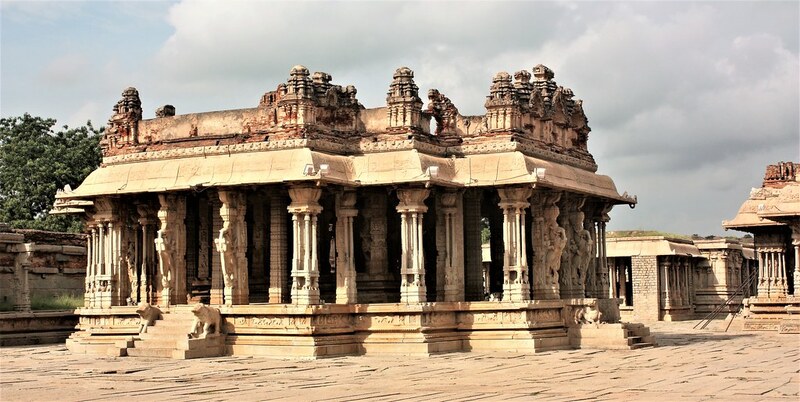 Built around the 11th-century; it was extended during the Vijayanagara era. The temple marks the center of Hampi with the Hampi Bazaar or the main village of Hampi surrounding it. The most sophisticated Hindu temple in Hampi is Vitthala Temple. It is part of the sacred center of Vijayanagara. We don’t have clear information on who and when the complex was built. Most scholars date it to a period of construction in the early-to-mid-16th century. The temple has a “Garuda” shrine in the form of a stone chariot in the courtyard; it is an often-pictured symbol of Hampi. Elephant Stables consist of eleven square chambers aligned north-south. The openings to the stables are arched; above ten chambers are alternating fluted and plain domes. The ceremonial guards of the royalty used this building. A garden with lawn forms the common courtyard of the elephant stable and the guard’s quarters. The Square Water Pavilion also called the Queen’s Bath, is in the south-east of the royal center. It has a pavilion, a water basin and a method of moving fresh water to it and taking away wash water and overflows. The basin is enclosed within an ornate, pillared, vaulted bay. The beauty of the ruins of Queen’s Bath gets to you the moment you lay your eyes on the unbelievable architectural style of this ancient royal pool. The temple contains two adjacent shrines, one containing the largest monolithic Shiva Linga and the other with the largest monolithic Yoga-Narsimha avatar of Vishnu in Hampi. The Shiva Linga stands in water in a cubical chamber and has three eyes sketched on its top. 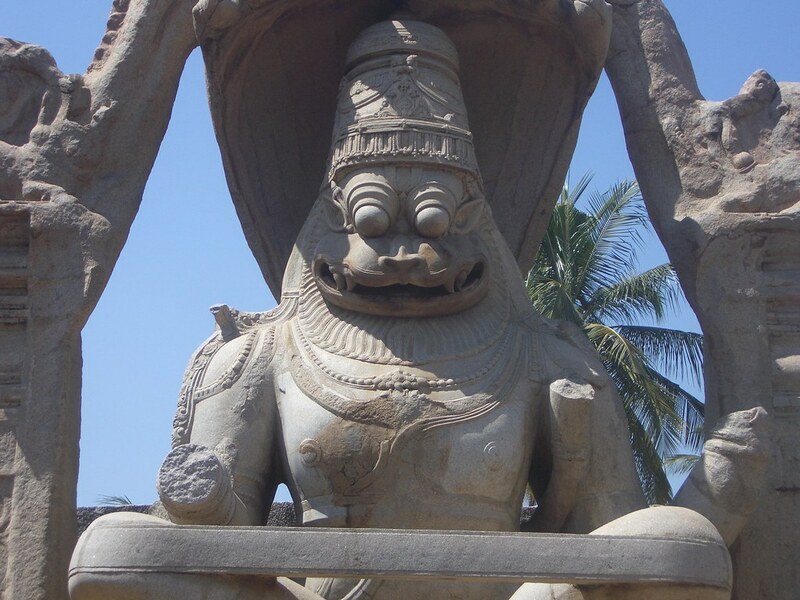 South of this is the shrine for a 22 ft high Narasimha, the man-lion avatar of Vishnu, seated in a yoga position. 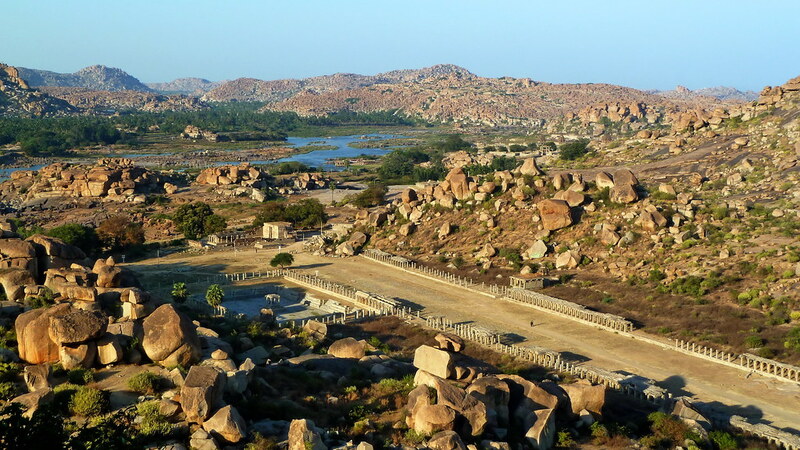 Matanga Hill offers a beautiful panoramic view of the entire Hampi. One has to do a gruelling 30-minute trek to reach the top, but the view makes the effort worth it. At the top of the hill is a temple. 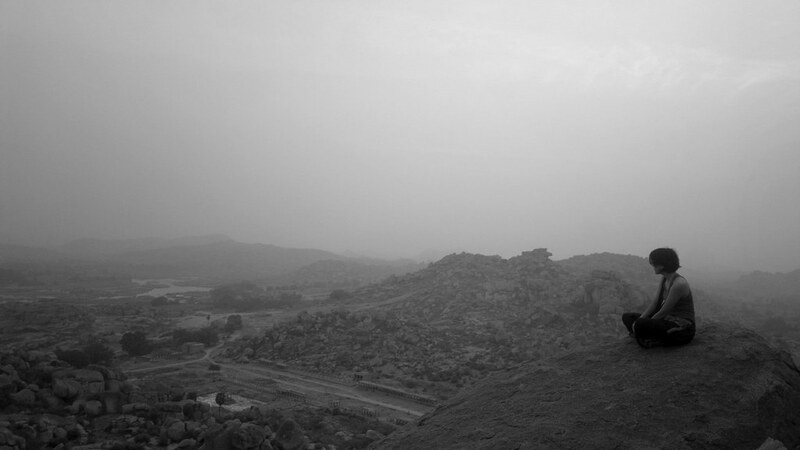 The hill is unarguably the best place to witness sunrise and sunset over the lovely landscape of Hampi. 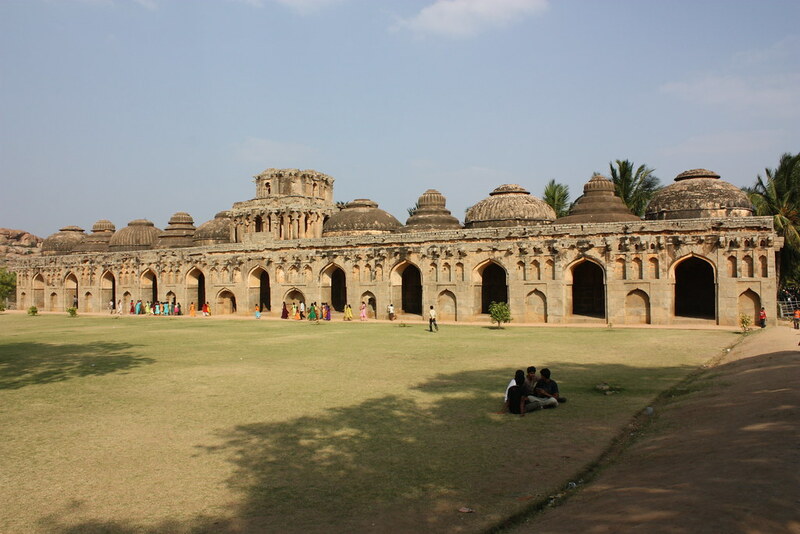 Over the years, Hampi developed a unique style of architecture. Later, this kind of architecture would be the Vijayanagara Architecture. Hampi is most famous for its temple architecture, which came to define the layout for many temples in South India. Giant compound walls and tall pyramidal towers typically enclose large Vijayanagara temples. These are also gateways to the temple campus. A very typical example of Vijayanagara style temple architecture is the Virupaksha Temple at Hampi. The basic layout of a large temple comprises of an enclosure wall with a monumental tower called ‘gopura’ that serves as the main entrance to the temple, an open pavilion supported by pillars termed as ‘mantapas’ to serve as public ceremonial and the main shrine dedicated to a deity, a goddess. Murals, relief panels and other legends of various gods adorn these temples. We can see this architecture in the Vitthala temple at Hampi. 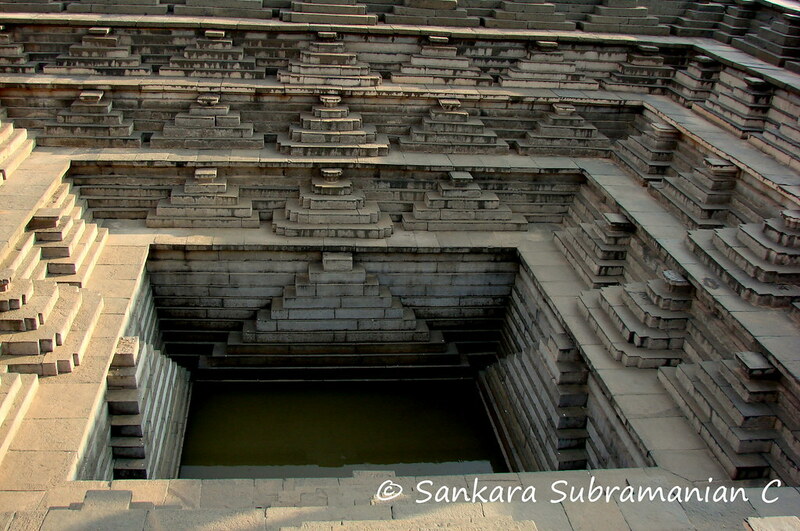 Hampi is also famous for its unique architecture of aquatic structures. The remains of Bukka’s aqueduct offers us the scale and ambition of such projects. There are a number of places to stay on both sides of the river in Hampi. Typically, visitors take a day to explore the main temples, elephant stables, and Matunga Hill and the other day to explore the other side of the river. The guesthouse stays in Hampi are usually cheap and you can book them easily, both online and on arrival. However, the prices can sky-rocket in the tourist season to up to Rs, 2000 a room. In case you’re looking to stay in a hotel, then you need to book a hotel in Hospet as Hampi doesn’t have any luxurious hotel options. A list of places to stay can also be found here. In terms of places to eat, there’s no lack of alternates. There are good restaurants on both sides of the river. The Mango Tree and the Laughing Buddha restaurant are the most visited places, which offer a broad range of food on the menu with mattress, cushions and low benches for one to relax and enjoy their meal. Hampi can be visited throughout the year, but the best time to visit is in the months of November to March to avoid the summer heat. Do not consume drugs and alcohol in the temple area, the local culture doesn’t appreciate it. Rent bicycles for sight-seeing only if you are fit enough to drive long distances and on inclines. Watch out for the monkeys, they would often steal and break valuable items.